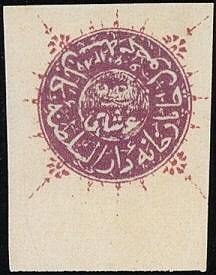 From a philatelic perspective, Afghanistan is of interest mainly for its early issues, especially the "Tiger's Heads." 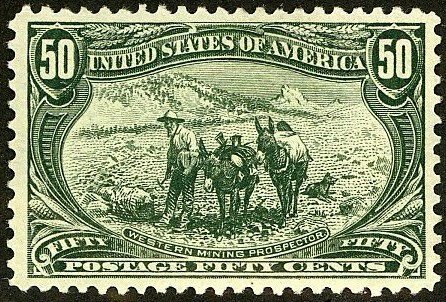 These crudely lithographed stamps have appeal to specialists throughout the world. When they were issued, most Afghan post offices did not have postal cancelers, so pieces were torn off of the stamps in order to indicate that they were used. 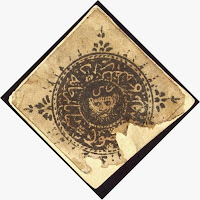 Tiger's Heads which catalog in the hundreds of dolla rs were probably produced in very modest quantities (low hundreds to the low thousands), although printing quantity information is not available for these issues. I recommend purchase of Tiger's Heads cataloging $350 or more, conditional on obtaining expertization. Personally, I prefer the unused stamps because I've been conditioned to view stamps with pieces missing as ugly, even though this is the norm for used Tiger's Heads. 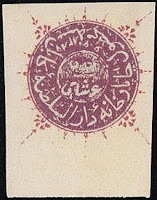 The two key Tiger's Heads are the 1872 6 Shahi Violet (Scott #8; Scott '12 CV = $1,350.00) and 1 Rupee Kabuli Violet (Scott #9; Scott '12 CV= $ 1,850.00, and pictured above at left) - either of which are worth jumping on if you find them at auction. A nation of over 28 million people, Afghanistan is one of the world's poorest countries. In 2010, the nation's GDP per capita was about $1,000. Its unemployment rate is 35% and roughly 36% of its citizens live below the poverty line. About 42 percent of the population live on less than $1 a day, according to USAID. However, due to the infusion of multi-billion dollars in international assistance and investments, as well as remittances from expats, the economy has significantly improved, with the GDP growing at an astounding 10 percent per year over the past five years. Opium production is a major part of the underground economy, employing over 2 million Afghans. Recent discoveries of major mineral deposits make the country look compelling from a long-term perspective. In 2010, Pentagon officials, along with geologists from the United States, announced the discovery of $1–3 trillion worth untapped mineral deposits in Afghanistan. The country may possess up to 36 trillion cubic feet of natural gas, 3.6 billion barrels of petroleum, up to 1.3 billion barrels of natural gas liquids and huge deposits of gold, copper, coal, iron ore, lithium, and other minerals.